DETZYME-PRO CLEAN is product of EBPL, which is high performance blend of hydrolyzingenzymes. 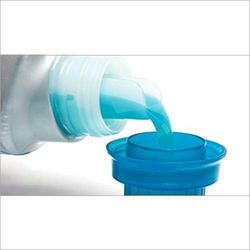 Used in laundry and dish wash detergents which helps to remove protein containingstains.It is stabilized protease enzyme product .Even when formulated with other enzyme , it canremain stable. FABRI CLEAN is a product of Enzyme Bioscience Pvt. Ltd. for laundry.Dosage: 40-50gm for 10-12 clothsDirection for use:• Pour the detergent into water. Mix the detergent in the water to disperse it tillfoam produced.• Place a load of dirty clothes into the tub of water.• Leave them to soak for 20–30 minutes then wash. Leading Manufacturer of 100% cotton knitted fabrics in various weights and qualities,cotton lycra knitted fabric, loop knit lycra fabric, french terry knitted fabric from SURAT. These fabrics are designed and woven using premium quality of yarns as per design needs of buyer. MR. CLEANER (Floor Cleaner) is a product of Enzyme Bioscience Pvt. Ltd. effective for removing heavy stain from floor and for regular cleaning. • Directly pour liquid onto the stain or by using cotton spread over stain . • Leave it for 20 minutes and then proceed with washing. • Dilute the liquid (10-15ML) in 1-1.5Litre)water. • Thoroughly mop to clean the floor. Packing: Products are available in bulk size as per requirement. We serve material with your own brand. its use for home care/ health care facilities, and resale in convenience stores. Looking for Detergent Enzymes ?